Having successfully established a hideout in the city of Kintargo, the heroes of the growing rebellion are poised to take back the city. But before the Silver Ravens can strike against diabolic House Thrune, they must forge alliances with nearby tribes of aquatic elves and the free city of Vyre to cut off Cheliax's easy sea and land routes, forcing Lord-Mayor Barzillai Thrune to rely solely on his resources at hand to defend his control of Kintargo. Yet nothing is as simple as it seems, and the dangers awaiting the rebels are not always those that can be defeated with a spell or a sword. And, of course, Barzillai Thrune won't take these new developments lying down—what retribution might one of Cheliax's most dangerous inquisitors have in store for the Silver Ravens? 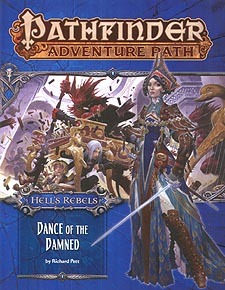 "Dance of the Damned," a Pathfinder adventure for 7th-level characters, by Richard Pett. A gazetteer of Vyre, the City of Masks, by Richard Pett. A look into the faith and worshipers of Mahathallah, by F. Wesley Schneider. A daring rescue attempt in the Pathfinder's Journal, by Stephanie Lorée. A menagerie of new monstrous threats, by Michael McCarthy, Alistair Rigg, and Todd Stewart.